We woke up to a beautiful sunny day! Laverne went walking with Sandy and John, who hadn't walked in a couple of days. It felt wonderful to be able to sleep in instead of rushing to get moving on the road. The hard part is going to sleep at midnight when it is still light outside. We are getting about 20 hours of daylight now. We brought black foam board to put in our bedroom windows to keep the light out. They are pretty effective. We went into town to do some sightseeing. Before we got into town we stopped at a place called Swan Haven; a place along Marsh Lake where Trumpeter Swans stop on their northward migration to rest and feed. They come through in April, so their wasn't much to see but a few stragglers. First stop was the Transportation Museum. Laverne worked for Canadian Pacific for 37 years, and the museum is next to the airport. Outside the museum is a DC 3 so precisely balanced it is a weather vane and will turn at winds as little as 10mph! It turned directions while we were in the museum! It showed a great pictorial history of early flight navigation in Northern Canada. I used to think all they did up here was mush sled dogs. Not twenty years after the Wright brothers took flight, they were flying all over the place up here. Very interesting. There was also information on the White Pass Yukon Territory RR, dog sledding, steamers on the Yukon River, travel to gold fields during the strike of 1898. From there I wanted to see the Old Log Church that was downtown. Here was the history of how religion came to Northwest Canada. The chasuble was made by the women of the Old Crow tribe by tanning the hides of two caribou and then the cr oss was made with red beads. The Log Cabin Church was used from 1900 until 1960 when a new cathedral was built. I was looking at an exhibit when I turned around, there was a man standing/hulking/hovering behind me; it was Bill Hicks. They were doing a walking tour of the downtown and this was their last stop. They are leaving in the morning for Dawson City. We should meet up by Saturday. We ate dinner before heading over to the "Frantic Follies" over at the Westmark Hotel. They had three or four tours waiting to get in. Good thing we had purchased our tickets earlier in the day. We sat in the second row; the show was excellent. I would highly recommend it. It is based on the poetry of Robert Service, who was a writer who lived up here during the gold rush years, along with Jack London! Can you imagine getting out of a show 10:30 in the evening at it's still daylight out? I would have hated to date up here when I was a teenager; where's the mysterious darkness, that makes all those guys look more handsome than they really were! On the way home we followed Laverne and Brenda through Miles Canyon and on the way out, we spotted a beautiful fox with a big bushy tail. This picture was taken about 11 pm at night! We moved our coaches into town to spend the night at Walmart. We fueled up as we came into town so we wouldn't have to worry about it tomorrow morning as we left. After that we did some food shopping at the grocery store. It's so very interesting to go shopping in another country. So much is the same and yet so much is different. They seem to have more of a selection from different countries than we do in the USA. Ran into Laverne and some people he has known for many years. So interesting. Did I mention that Laverne and Brenda are going camping with us up to Dawson City? What fun we will have. These are some pictures taken at their house on the lake. Just Beautiful! Last night Bob discovered that the fog lights on our car have both been knocked out by rocks. They are below our rock shield we have attached to the car. He also carved a piece of carpet to place over the windshield to keep rocks from breaking our windshield. Our little caravan took off for Dawson City about 9:30. It was a rough section of road on the way up. There was a "Whole lot of shaking goin' on." Have to remember to be careful when opening cupboards and the fridge when you stop! We haven't seen any wildlife for the last couple of days and I didn't think we would see any today, but we got lucky and saw another black bear on the side of the road. They are all looking very healthy and have shiny coats. We pulled into a provincial park about 10 miles before reaching Dawson City. We'll drive in tomorrow morning. Today was a long drive. I really miss my grandbabies. This is the first time I have missed her birthday party, although the party is not until tomorrow. We don't have cell phone or Internet service here, so we are really out of communication. Drove into Dawson City with the RV's and parked right along the river front. No sooner had we gotten out to walk than Bill and Margie passed us and said they were going to gas up and would catch up with us. Dawson City is one place that has retained most of it's original flavor. You have to walk on wooden boardwalks and the streets are not paved. Many buildings are original, many have been restored, and any new buildings are made to look old. Dawson City was the original capital of the Yukon Territory until it was moved to Whitehorse. Unfortunately, my foot was giving me lots of trouble and I needed to go back to the RV to rest. After a late lunch, the guys wanted to drive up to the gold dredge and maybe pan for gold, so I went with the guys, while the ladies headed over Diamond Gerties to play the slots. I enjoyed the dredge and the guys went on a tour of the dredge. When they got in the car to leave, the car wouldn't turn over, we had a dead battery. We were lucky to get a jump from a guy coming down the road from another claim. They are still actively mining gold up here, so you just can't stick your pan in the water just anywhere. They take things real serious up here. By then it was so late, we headed straight back to town, so I did NOT get any gold. BOO!!!! We took the ferry across the river to camp at the Yukon River Campground. The ferry can hold 2 40' RV's with toads and maybe two other cars. There are not a lot of docking facilities, they just run up to the riverbank and drop you off. When the river floods they just rebuilt the dirt ramp; it's simple, it doesn't cost much, and not much maintenance is required. It's not big like ours at home, but it is free. The Yukon River is still running very swiftly from the snow melt off in the mountains. So we are all camped over here for the night. Margie and Bill, Brenda and Laverne, Tillie and John, and Bob and I. Since Tillie had won at the casino, she didn't care to go back, Margie and Bill had been last night, so Brenda, Laverne, Bob and I went back into town, but first we headed up to Midnight Dome to get a view of the whole valley. Great views! But there was cloud coverage overhead so it wasn't all that pretty. Nobody won anything at Gertie's so we headed home. It had rained fairly heavy during the night, we woke up to lots of mud. Bill and Margie headed out about 8:30.. We said our good-byes to Brenda and Laverne who did not bring their passports with them and were not continuing on. We didn't get on the road until 10am. We drove straight up to the clouds and while talking to John on the CB, we were surprised to hear Bill cut in. Seems he was right ahead of us. They had sat there for two hours waiting for the rain and clouds to clear and decided to return to the campground and wait for a better day to travel across Top of the World Highway. Bob and I agreed and soon John and Tillie returned with us. Once we got back we headed into town to get an up to date weather report. But it seems, the Canadian visitor doesn't give updates on Top of the World Highway! Brenda and Laverne had moved their RV into town for the day and so we got to see them once again. Bob and I returned home while the others stayed in town. It was nice to just relax for a while. The sky cleared up tremendously and it looks like a go for tomorrow. 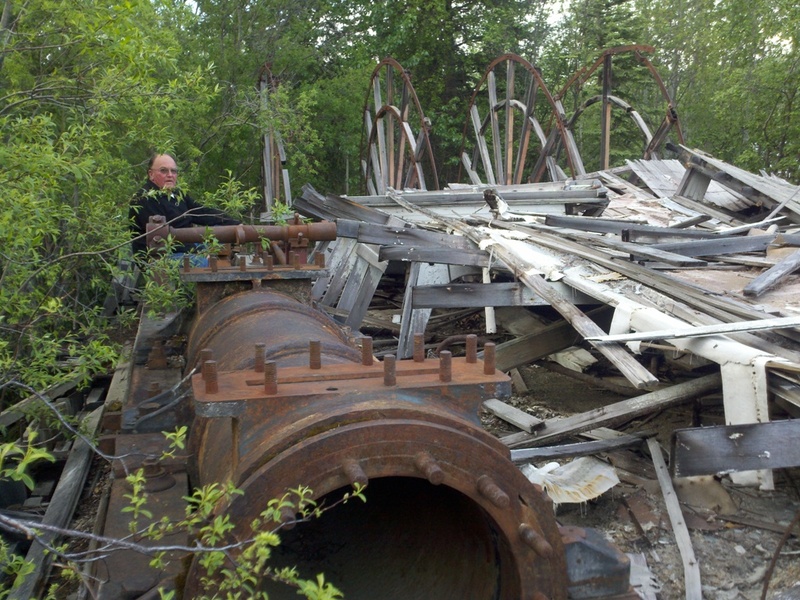 After dinner Bob an John hiked up the river to see the old abandoned river paddlewheelers that were beached in the riverbank and are currently in a state of advanced deterioration. Later we stayed in the cooking pavilion, stoked the heater/stove and played cards till after 10 pm because it stays light so late up here. Today's the day. We are going, the sky is blue!. We put Bill and Margie in the lead again. On the way up the sky was clear, much better than yesterday. But once we were up high, we still ended up in the clouds and at times we all had to run our 4 way flashers so we didn't run into one another. It runs across the ridge tops of the mountains and on CLEAR days (whenever that is), you can see forever. The road was paved most of the way through Canada. Once we got through Customs at the US Border the road immediately turned to yellow dirt. But at least now the mileage signs are in miles and not Km, I can stop using my multiplication skills. We finally came to Chicken which has a population of about fifteen. This is another place that you can pan for gold. It's not something I have a real urge to do when it is wet and drizzly outside. From there it was downhill all the way to Tok, Alaska, where the sun was shining and the air was warm when we got out of our RV's. John, Bill and Bob walked over to the post office to get the mail. Ours was not there, so we have to spend the night and the others are stopping for the night also. We are staying at Sourdough Campground with full hookups! Yeah! That is always a treat for me. They also had a car wash which we took advantage of immediately! When we get home, I am going to have our car washed and detailed! There was a Sourdough Pancake Toss contest at 7 pm (where you could win a free breakfast), followed by Karaoke and music by Don Lee. We didn't win anything but the music was pretty good. I even got brave enough to stand up and sing "Crazy" by Patsy Cline. Our mail did not come in. Boo! Looks like we will be spending another night staying in the back of the Chevron Station. The others are continuing on to Fairbanks. Before we parked our rig, we stopped at the RV wash to clean our rig. OMG! The dirt and rocks must weigh a ton. Getting rid of all that will surely increase our MPG!. It's also when you find out if you have any damage to your rig. We came out okay. The rest of the day was spent catching up on emails, bills, my blog, and just RESTING! Yeah! Our mail is in. We can continue on to Fairbanks. Of course it is cloudy and drizzly. One stop we made was at Delta Junction, the End of the Alaskan Highway, 1422 miles. We saw 2 moose cows along the way, but only got a picture of one. By the time we got to North Pole, Alaska it was 6pm. I wasn't sure they were open, but most places up here stay open until 8pm. because of the long hours of daylight and travelers take advantage of that. Bob and I got to meet and talk with Santa, get our pictures taken and go see his reindeer. Fun place. We finally got into Fairbanks about 8pm., meeting up with the others at Walmart. Spent a good part of the day stocking up from Sam's Club and Walmart. My foot was really hurting so came back and got it up while I took a nap. Weather was rainy in the morning, followed by a slow clearing in the afternoon. (Every day can't be great day.) The picture of the sunset has a time stamp of 11:32 pm. The sun is scheduled to rise at 3:10am. I will not be staying up to check it out. It truly does not get dark up here at all. John and Tillie left this morning for Denali National Park. They have to be in Anchorage by Monday evening to pick up their grandson at the airport so they are on a tight schedule. It was hard to say goodbye to our traveling companions of six months. But we should see them again in a couple of weeks. We went down to the Visitor's Center in downtown Fairbanks where they have an excellent display of animals and life for the native Indians. We came back, picked up Margie and Bill and headed over to the Steamship Discovery for a 3 hour tour. 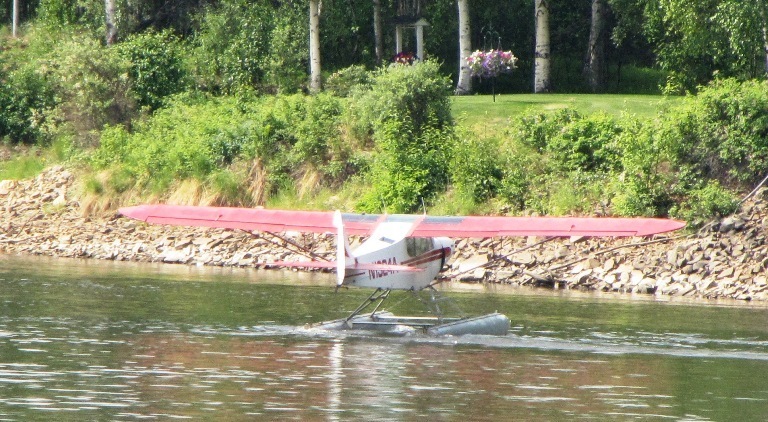 One of the first things we saw was a bush pilot taking off from the river. The picture to the right shows a plane in someone's back yard. To get out of there, they use the grass strip running behind their neighbor's houses. One in sixty Alaskans has his pilot's license. This tour also included stops at Susan Butcher's Dog Kennel. Susan won the Iditarod Dog Sled Race from Anchorage to Nome, Alaska a record 4 times. . The dogs pulling the 4 wheeler below can maintain a speed of 20 mph. The ship also stopped at the Chena Indian Village, from the early 1900's, before their life was touched by the white man. Wonderful presentations by young Chena Indian girls describing life back then. They displayed an absolutely gorgeous fur coat made by women from the village, estimated to be worth over $30,000. In the evening we went back to the visitor's center to watch a couple of films: one was life in Fairbanks at 40' below zero. Talked about staying fit during the long winters, fighting depression, staying warm; it was so interesting.The other was on the phenomenon Aurora Borealis. Sidebar: There are poles in the Walmart parking lot with plugs on them so you can plug your car in so the engine won't freeze during the winter! Called my sister today. They are leaving on their trip on Thursday. They will be traveling to the polar ice cap on June 30. Monday we are going to try and make it to the Artic Circle. She will be at 83° and I will be going to 66° 33'. Same difference don't you think? I am calling today North Carolina Day. We went over to Creamer's Field to see Northern Waterfowl. Saw a lot of Sand Hill Cranes and Canadian Geese. Talking with the woman in the visitor's center she mentioned she was from North Carolina...when I asked where, she said Emerald Isle, about 60 miles from where we live. You just never know who you will meet where. It truly is a small world. They are volunteering for seven weeks and then they are taking off for Denali National Park. We also stopped at the University of Alaska Large Animal Research Station where you could see wild musk ox, caribou and reindeer. The musk ox were the most interesting by far. They have a hairy under fur called quivit which is lighter and softer than cashmere! You can buy it, but it is VERY EXPENSIVE! About $85.00 a skein!. It's like wearing a cloud it's so light. Afterwards we decided to eat early since we skipped lunch, and headed for Big Daddy's BBQ - The Northernmost Southern Barbeque! Visited and recommended by Guy Fieri on Diners, Drive-Ins and Dives. They carry all kinds of Southern BBQ from Memphis, Texas, Arkansas, all over and North Carolina style! It was delicious!! We had fried okra, homemade coleslaw and Eastern style pulled pork so tender and moist it melted in your mouth. The only thing that spoiled it was the little bit of sweet sauce they put on it. If we had talked more before we had ordered it, they would have held the sauce. I would highly recommend this place to any Southerner passing through Fairbanks! Fairbanks is Alaska's second largest city with a population of of 35,252. The Chena River flows through the middle of town. It's a place where you can still see people living in log cabins beside those in modern homes. Fairbanks is flat and a great place to ride bicycles. They say you can see Mt. McKinley from here, but so far, no luck. We moved over to River's Edge RV Park in town. Full hook-ups with 50 amp service. We were able to get all our laundry done, using both the laundromat and using the W/D in our coach. We took a break in the afternoon to go to Pioneer Park, sort of like a living history museum for Fairbanks. But it started to rain and my foot was hurting again so we came home long enough to eat, then headed to Safeway to do some shopping before coming home and gongWe moved over to River's Edge RV Park in town. Full hook-ups with 50 amp service. We were able to get all our laundry done, using both the laundromat and using the W/D in our coach. We took a break in the afternoon to go to Pioneer Park, sort of like a living history museum for Fairbanks. But it started to rain and my foot was hurting again so we came home long enough to eat, then headed Safeway to do some shopping before coming home and gong to bed. We have a long day tomorrow. Today the sun rose at 3:04 am and the sun will set at 12:38 am. With only twilight in between. By next week....the sun will set at 12:48 am and rise at 2:58 am. with only 2 hours on dark daylight in between. It's crazy up here. That being said, today we drove with Margie and Bill, up to the Artic Circle 200 miles north of Fairbanks. They warn you to take at least 2 spare tires mounted on rims, CB radio, and be prepared to be blown off the road by truckers and/or get your windshield broken. This is also known as "The Ice Trucker's Road". It's paved only the first 50 miles, the rest is mud, pot holes, frost heaves and such The books aren't too encouraging are they? One of the first stops we made was at the Pipeline Information Kiosk. The pipeline is 4 feet in diameter plus insulation and outer sheathing and runs 800 miles from Prudhoe Bay to Valdez, Alaska. The road was not that bumpy, but it was MUDDY. We did see a couple of truck campers, a few trailers, but no motorhomes. When we crossed the bridge over the Yukon River, we were told it was the only bridge over the Yukon for the entire 1,900+ miles. The Alyeska Pipeline crosses underneath the bridge. The weather was very cloudy and rainy. It was not a very scenic trip and yet it was more that what we were expecting. Coming up a rise on the road, we had to come to a quick stop, for standing in the middle of the road was a moose cow. She was big! Before we could get our cameras out she shot off like a flash into the woods and disappeared. Not to leave without our photo op, Bob and Margie jumped out of the car with cameras in hand and the chase was on. They got their pictures. YEAH! The trip was worth it just for those pictures. Up at the Artic Circle, there is a sign where we could get our pictures taken, and there was a BLM ranger there handing out pins and certificates. We are now bonafide certified! He also had his intern with him. She is a student at Clemson University spending her summer in Alaska! Coming home Sandy had to stop by the side of the road and throw some water on our front window. Why bother with the back until we got all the way home. He couldn't see a thing out the back window. Today we moved on to Denali National Park area. On the drive down we stopped in the small town of Nenana. There was an interesting historical train station and also a museum. We have reservations for the Riley Creek campground in the national park that start on Thursday through next Tuesday. Until then we are having to find a spot to spend a couple of nights. Tonight we are in Healy, parked in a community center parking lot between an outdoor hockey rink not used in the off season and the volunteer fire department, community center, bank, and state troopers office. Now that's what I call multipurpose! Again it has rained off and on all day today. Will it ever stop? Pictured below are some of the wildflowers and wildlife I photographed along the way today. Bill and Margie got reservations for today at Riley Creek Campground. We will stay here at the community center one more day and just vegetate and relax, catch up on bills and write on my blog. It's a very rainy day and the temperature only got up to 51 degrees. We do have reservations for tomorrow. After dinner, the sky cleared up, so we drove down to the park and drove the park road to see if there was any wildlife we could view and maybe catch a glimpse of Mt. McKinley. But there was nothing to be seen. On the way back we stopped at Riley Creek campground and found a sight we liked. Hope we can get it tomorrow. We woke up to a clear and sunny day with light puffy clouds. First order of business , get set up at Riley Creek campground. We had no problem getting the sight we wanted. After we were settled, we headed up to the Park Visitor's Center, which had great info, fabulous displays of wildlife and films. After lunch, we grabbed a bus that went to the Denali Dog Kennels. They have had a working sled dog team in the park since 1939. They do a lot of work in the winter; they haul logs, take supplies up to the winter outback cabins, check on winter campers, snowshoers, cross cross-country skiers, haul scientific equipment for research teams, and cut trails for people who run their own dog sledding teams in the park. They pretty much have their summers off as it is too hot for them. They were languishing in the heat today and it only got up to 68 degrees! These are not pure bred dogs, but a mix of breeds that have been bred for temperament, fur coat, enthusiasm for running and other factors. They also used to deliver the mail within the park. The park has been charged with protecting the wilderness here and the dogs do it so much better than equipment that breaks down at a minus 30/40 degrees. These guys just love it. It's fun to see them get all excited when they see their handlers starting to put together a sled for running. They start jumping and barking, "pick me, pick me". After dinner we went to the Ranger campfire program on the wolf and the Lynx. The program was so interesting and we learned a lot. He also had pelts of the lynx and wolf. (Becky, you would have really liked this program). Before we got into the program, we practiced what to do in a bear encounter. Kind of like a lifeboat drill on a cruise ship. It needs to be done. To get to the amphitheater we walked down a path that said: WARNING! Moose calving area AND grizzly bear hunting area BE ALERT! That will get your attention right quick. We woke up to another bright and sunny day. We quick jumped in the car and headed back out to the viewpoint to see if we could see McKinley. (It's official geographic name is still Mt. McKinley, but the park name was changed to Denali). Denali in the Athabascan language means "the tall one" or "the big one". Well, WE MADE IT! Yippee! We are now part of the 30% club. Only 30 percent of the visitors ever get to see Denalli because it is covered in clouds. It is so huge it makes it's own weather! You must remember the pictures of the mountain are taken from 70 MILES AWAY! On the way up there we almost ran over a snowshoe hare; had to brake hard.. A little further up the road there were cars stopped on the road with blinking emergency lights. A grizzly bear was crossing the road. It looked like he was on the scent of something he was tracking, but we got some great pictures, much closer than what they say your supposed to do. Further on, we saw about a half dozen caribou. When we got to the turn around part of the road, we got out to look around. High on the mountain I spotted about 4 Dall sheep. Also, located on a gravel bar in the Savage River was a sea gull sitting on a nest. Sure hope the river doesn't rise! After dinner, Bob went to the Ranger program and then walked the trail to the visitor's center. Riding the bus on the way back, he spotted a moose cow, standing on the side of the road. It always happens when I don't go. We are headed further into the park to camp at Teklanika River Campground. You have to have a pass to drive down the road this far, stay a minimum of three days and leave your toad vehicle behind. On the way in all we saw was about twelve snowshoe hares, one of which posed very nicely for me. Although the sky was crystal clear blue, there were clouds all around Mt. McKinley and it could not be seen from the viewpoint. Once we got setup, we (Margie, Bill, Sandy & I) hopped on a bus about noon and road to the Eielson Visitors Center. The driver was very informative about the wildlife. On the ride up we saw many Dall sheep, Artic Ground Squirrels, Caribou laying on snow to get relief from insects, Snowshoe Hares, Grizzly taking a nap, and the best shot of the whole ride...two grizzly bears mating! No, it's not funny; but to see life in the wild, not something put on by a zoo, you feel like, I don't know, maybe all is right with the world. I just can't bring myself to post that picture here, but there is a picture of him after THE DEED! We had thirty minutes to spend at the visitors center if we wanted to take the same bus back. It's a new building that is totally green in it's carbon footprint. They use solar panels, hydro-electricity from the creek below to charge their batteries for electricity, passive solar heating, and ultra-low flow toilets. It's also build into the hillside to aid in temperature regulation in the building. They earned a Platinum Award for their design. On the ride back, the grizzly was awake and feeding, the mating bears were gone, the caribou had gotten up and were feeding, there were more Dall sheep and more squirrels. All in all a good day for a six hour tour. Seeing the animals got my adrenalin going and when it was all over, all I wanted to do was crash and burn. We have bus seats reserved for doing this again tomorrow and travel all the way to Wonder Lake. I don't think I am going. This morning was overcast. I definitely didn't go. Bob was able to get on the same bus as Bill and Margie so he was not alone for the ride. They caught the bus at 8 am and I had the whole day to myself. Seems kind of selfish but it was what I wanted to do. I sat down to read the book, "Tisha"; about a young girl nineteen years old going to Chicken, AK, to teach in 1927. The only way to get there was by pack train on horses. It's all about her first year and the trials and tribulations she went through. very Interesting reading. Bob got home around 4:30. He finally got a picture of a bull moose and a coyote, but still no wolf. They went all the way to Wonder Lake today. I put on a pot of spaghetti for dinner before he went to the ranger talk over at the amphitheater. I read some more. I was still reading by the light of the sun at 11:30pm before the sun went below the mountain, but the sun didn't set until sometime after midnight. It was raining when we woke up this morning. It had been raining during the night. Bob had canceled his Discovery hike with the Ranger for today. Its a good thing he did. He didn't really have the proper equipment for today anyway; extra socks, extra shoes for crossing streams, backpack, etc. Bill and Margie canceled also, and Bill decided to leave rather than spend the day sitting here. They will stop at Riley Creek Mercantile to pick up email, dump and water before heading on to Cantwell. We will probably catch up in Talkeetna. The sun appeared before noon, so Bob and I went walking along the river gravel bars looking for animal tracks. I really tied him down, because of my bum foot, so I couldn't go very far. It's frustrating for him and painful and upsetting for me because I can't do very much at all. But I did see some new flowers while we were walking out there. It was a good day for walking cause the air was cool and the sun was shining. We had a wonderful steak dinner before Bob went to the Ranger talk on bears. Sounded interesting.. Afterwards he came back and then headed out again to find the couple he met from North Carolina, thinking he had met them before. I went with him also, but they didn't ring any bells with me. Driving out from Teklanika Campground we came across this grizzly bear. He was walking all over the place, just doing his morning stroll I guess. After last minute gift buying and picture taking we finally left Denali a little after noon, headed for Talkeetna. While it was beautiful and sunny in the morning, the clouds rolled in big time the further south we headed on the Parks Highway. We could not see the mountain from any of the southern viewpoints. Not Cool! We arrived at the junction of Parks Hwy and road to Talkeetna late in the afternoon. It's a fourteen mile drive on the spur road to the little town, and we drove in after dinner to see what happens in the evening. On the way in, we were surprised by a wonderful southern view of Denali! There is a small bluff just before you go into town...and there was a great shot. Amazing! Driving through Talkeetna is like a whistlestop; not much to see, and yet it was very quaint. Tomorrow we will go back for another look see. We are up and moving this morning. We did not get to see Denali on the way into Talkeetna this morning, too many clouds. But the tour buses/or the train from the cruise lines were here bright and early. Tourists were crawling all over the place. It's what keeps this town alive. Many of the businesses have wooden mooses displayed in front of their buildings. I have seen many other towns use this type of attraction. We also got to meet Mayor Stubbs in his office this morning. The only problem was he was taking a nap and not really interested in us. He was the winner of a write-in vote during elections. The simple fact is: MAYOR STUBBS IS A CAT! This is also the town from which all the climbing expeditions leave from. Most of them fly to a base camp at 7,000 ft. There is a Denali Park Ranger Station located in town. All expeditions must register, and take an indoctrination class and inspection of equipment and supplies before they are allowed on the mountain. Currently there are 309 people on the mountain. The numbers are controlled by the ranger station, to protect the mountain and it's environment. What the climbers take up, they must bring back down, including all human waste. Mt. McKinley is the farthest north of the seven continental mountains that are challenged for climbers. That also makes it the coldest of the seven, including Mt. Everest. Sidebar: I just learn so much when we are traveling. Leaving there, we are headed South once again, headed for the Super Walmart in Wasilla to stock up on groceries. I wonder if Sarah Palin is home??? We thought we would head to Seward and join John and Tillie. Then Bob remembered Anchorage has the only ATM/bank in Alaska for our bank. It was located in the downtown business district in an indoor shopping mall on the 4th floor! To make matters even worse, Anchorage is full of one way streets! You should see the crazy lines that were drawn on the Garmin! LOL! It's still light so we are still traveling on. Followed the road South driving beside Turnagain Arm. It's a long shallow bay that has very steep and fast tides, like the Bay of Fundy. (We found out it does have the second highest tides.) But alas, we missed the tide change and it started raining again and the cloud cover got real low. We stopped at a pullout to take a picture of the train and I was waving to the engineer, and he was pointing his finger at me, or so I thought. When I turned around, there was a Mountain Sheep about 30/40 feet up the sheer wall of mountain next to the road, eating the grass! I don't know how they can climb like that, amazing! We spent the night at the Portage Glacier Cruise Boat Terminal overflow lot. It is also the trailhead for the Blue Ice Glacier that was above us. It was a low cloudy and drizzly tonight, it got so dark that we didn't need the cardboard in the windows at night. We woke up to sunny and blue skies. We could see that we were surrounded by glacier filled mountains. Just beautiful! I know the pictures won't do it justice. It stayed sunny all the way into Seward. Got in around 1 pm. We found John and Tillie just as they were taking their grandson out sightseeing. So we are now set up on the front row, right on the water, facing Resurrection Bay, surrounded by snow capped mountains, absolutely gorgeous! Afterwards, we did some sightseeing on our own and checked out the visitors center for the Kenai Fjords National Park. By the time we had gotten back to the campground the winds had picked up considerably, sunny but WINDY!! The ducks in this picture are called Harlequin Ducks Their plummage is much richer and stunning than what you can see in this picture. The best way to see this park is by booking a tour on a private charter boat. They rangers do not run any boats themselves, but they do talks on these private tour boats. There is one glacier to can drive up to on the land side and it is called Exit Glacier. We will probably go take a look the next day or two..
Sidebar: Alaska is different in many ways. They don't have counties, like most states, they have boroughs. The Natives (Indians and Eskimos) don't live on Reservations, but they are formed into Corporations that were developed in 1971, based on census records at that time. They have control over a lot (and I mean A LOT) of land up here which is privately owned by them. You need their permission to trespass on their land. Some of which is in the National Parks here in Alaska. After dinner we were sitting over at our friends coach, when we heard sirens going off. Their local friend who was visiting them said it was a TSUNAMI WARNING! ! ! ! Bullhorn announcements said to tune into the local radio station FOR INSTRUCTIONS! We didn't know where the local station was located on the dial!!! Now remember we are right on the water ! ! ! ! Woke up to another sunny morning. The water on the bay was very calm, almost like a sheet of glass. When I looked out the front window, there was a cruise ship down at the docks. The Celebrity ship "Millennium" is in town until 10pm this evening. This is the Northern cruise port for Celebrity and Royal Caribbean. Princess Cruise Line comes into Whittier, and Holland America docks both here and at Anchorage. John and Tillie's grandson, Devon, got to go out on a commercial fishing boat for the day. He loves fishing and he was so excited to be going. Just about the time we were wanting to go for a drive, it was time for his boat to come in. So we all went down to the dock, to see what they had caught. They sold 240 lbs of cod to the local fishery. Devon caught another halibut. They are as prized up here as the salmon. He also hooked a skate. Said it was the hardest thing he ever had to fight to reel in. Of course, they let it go. Everyone was happy that he was so happy. He caught about 70% of the catch for the day. There were only 3 people on the boat including Devon. The wind picked up again today, whipping about 15 mph. The wind chill factor was pretty CHILLY! It was not a good day for sitting out. We were going to ride over to the other side of Resurrection Bay, but we didn't go once Devon returned from the boat. Both John and Devon are going out again tomorrow, so we will do some sightseeing on our own. We can now add that to our list of big animals we have seen in Alaska. John and his grandson Devon went out on a fishing boat charter today for the whole day. It wasn't a very pretty day and the water in the harbor had whitecaps. That is not for me. So Sandy and I took off to see the local sights. We chose to go see what's on the other side of the bay. There wasn't much except a maximum security Alaska State Prison and some boat yards.....and....some wildlife. We had just turned off a dirt road and Bob said, "What's that standing up ahead? It's a bear! (black) I couldn't grab the camera fast enough, for when I did, he disappeared into the trees. So we thought we would catch him on the other side. So we drove around the block, but we never saw him again. Bob was taking one last swing around the block, when we got to the other side, we saw the rear end of a moose going into the woods. YES! That would make an even better picture; but he proved elusive as well. Finally he took a short cut through the boat yard and we drove to the other side, just to see him go into the bush once again. This time we turned the car off and Bob got out of the car, being real quiet and waited patiently. VOILA! Today was another cold and raw day, even if it did make it up to 58 degrees. The sun never appeared at all today, but it doesn't seem to keep the people who live up here from getting out and enjoying themselves. There is a bike pathway right in front of our motorhome and I think everyone from Seward was on it today. Biking, walking, runners with leggings; people with every imaginable kind of dog. Everyone in Alaska must own two or three dogs, and all so well behaved. (well, mostly behaved anyway). We had neighbors that left today, who had taken their two week old baby, kayaking! In these frigid waters, you've got to be kidding me. What if they had overturned into the water....I'm not even going to go there. There was a Holland America Cruise Ship in port this morning. For such a small town, they do a great business in cruise ships. It left on the rising tide in the evening. Stayed home and vegetated today. Caught up on blogs and housework. We had to do laundry today. Ouch ! ! ! $3.25 to wash and $3.25 to dry; and those machines don't run 25 cents at a time, it's all or nothing. That's $6.50 a load. We had to do at least 4 loads. You figure the math, we are broke. (Bob, you better start wearing your socks a little longer, they aren't dirty enough yet!) Margie and Bill finally arrived late this afternoon. We were able to secure them a spot next to us. Happy Anniversary Betsy and Mike! This is what we woke up to this morning. A bald eagle sitting on a pier piling out our front window! Considering we are getting ready to celebrate our nation's birthday in a day or two, I thought this picture was rather appropriate. I took my Dramamine as directed and it worked wonderfully. Thank goodness! It's wasn't very rough but the boat did rock. We left the dock at 10 am with a 90% female crew including the captain! You get a whole different perspective of a place when you look at it from the water. She (the captain) gave a short history of Seward, including the 1964 earthquake that swept away the waterfront, docks and the first couple of streets. Three tsunamis are basically what caused all the damage. But they never rebuilt the waterfront, opting to move the dock further up the bay. So we are now camped on the old dock sites. We are the tan colored RV facing the water. Great waterfront views, great real estate. We were able to watch our current position on the real time map on the front wall of the cabin. We could also tell the depth of the water is you looked real close! Our next sighting we came across a couple of humpback whales feeding. It was really great to see their tail flukes waving at us. Captain got word there were more whales around the point. Sure enough there were and they were really feeding/hunting like crazy. We got to see how they circle the fish and blow bubbles to confuse the fish and then they sweep right in and, GULP! It's din, din time for the whales. We even had one go right under the boat! You could follow it's bubbles from one side to the other, and he came up so close to the boat you could see all the barnacles on him. Bob had the camera but didn't get there in time. After that it was on to sea lions laying up on the rocks. It really looked to me like they were cold and just trying to get out of the cold water. But you could hear them "talking" with their grunts and growls. You could also see there was a pecking order as to who got to lay where. (The thermometer on the boat said it was 50 degrees, but it never added in the wind chill over this cold water, brrrr! Felt like was 32 degrees. We got up close and personal at the Aialik Glacier. It was AWESOME! You could see it calving and dropping into the water It was so blue. There were kayakers paddling around out there. I guess everyone defines "having fun" as something different, but you won't find "kayaking by glaciers" under my list of fun. Too cold, damp and windy. When we turned around and left the glacier there was a black bear off our starboard side. Guess he was looking for some fish, or maybe just some berries, OR maybe just taking a stroll on the beach! The sun never did come out today so all the pictures are dull looking. Then again, I didn't have the sun glare bouncing off the water into my eyes. From the glacier we went out to the Chiswell Islands, which are part of the Alaska Maritime NWR, on the Gulf of Alaska to see many artic birds. These included the Cormorants, Common Murres, Horned and Tufted Puffins and many gulls such as the Kittiwake and the Mew Gull. (Glad I am writing this down, I'll never remember all those names). Then it was on to Fox Island for our dinner of salmon and prime rib before heading home. It was a fantastic day, even if I did lose my hand knitted scarf.